Pimento-stuffed green olives, KRAFT Sun Dried Tomato Vinaigrette Dressing and tuna are all you need to make this savory Mediterranean dish. 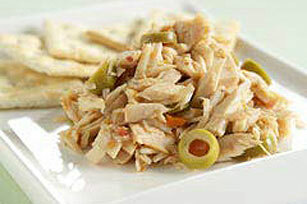 Mix tuna, olives and dressing until well blended; cover. Refrigerate several hours or until chilled. Garnish with 1 plum tomato, cut into slices, just before serving.